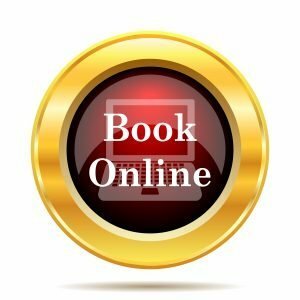 Alopecia Totalis – a loss of all scalp hair. Alopecia Universalis – a loss of all scalp and body hair. 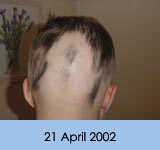 Alopecia Totalis and Alopecia Universalis are variations of Alopecia Areata at its most extreme. It is not known why a person will suffer just a few bald patches and another experience total hair loss. Alopecia Totalis may start as bald patches and progress over a period of months or hair may fall out acutely over a period of days or weeks. 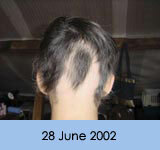 The recovery probability of Alopecia Totalis and Universalis is lower than that of Alopecia Areata. Recovery is more likely in those who seek immediate help, than those who have had the problem for years. 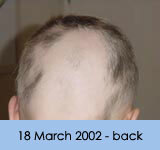 Many patients who have sought help at The Cotswold Trichology have achieved full recovery within 12 months. Others, sadly, do not react to any form of treatment, medical or complementary. 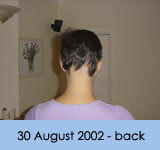 On Saturday 8th September 2001, I was blow-drying my shoulder length hair when my husband asked me what I’d done to my head. I looked at him blankly. 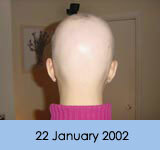 He held up a mirror to the back of my head to show me a bald patch about 6cm in diameter. On further examination I noticed, in addition to the large bald patch there were several smaller bald patches each about the size of a ten pence piece. I called the emergency GP but she couldn’t really diagnose without seeing it for herself. She suggested I wait and see my GP on Monday. The next 48 hours seemed the longest in my life – every time I ran my hand through my hair I would pull out a small handful. Monday morning couldn’t come quickly enough. I hoped that my GP would look at my hair and tell me why this had happened and how to prevent it getting any worse but he couldn’t find any medical reason for it. He suggested tying back my hair until it had recovered. He was confident the hair would grow again and in a couple of months I’d wonder what all the fuss was about. At this point I was still able to cover the bald patches by tying up my hair in a ponytail. He reluctantly referred me to a dermatologist but I had to wait 10 weeks for the appointment. Still the most important question remained unanswered – Why was it happening? In my mind a healthy person doesn’t just suddenly start losing large patches of hair. I spoke to my hairdresser, who I thought might have seen this sort of thing before. She told me it was called Alopecia -I’ve since learnt is an umbrella term for hair loss. I searched the Internet for Alopecia and found a lot of information but nothing to really explain why it happens. There seemed to be an awful lot on Alopecia Totalis and Alopecia Universalis; the worst-case scenario that I couldn’t believe would ever happen to me. Fortunately, my husband Jamie had heard of Trichology, so he searched the Internet and at the top of the list of results was the Cotswold Trichology Centre. He called and spoke to Sally who suggested coming in the following afternoon. This gave me a new glimmer of hope. 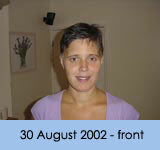 From the moment I stepped in to the Trichology centre and spoke to Sally, I felt much calmer. 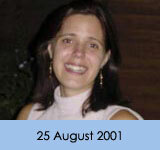 During the initial consultation she asked questions about my lifestyle, stress and general health. She took the time to explain why and when the hair loss had been triggered, suggested changes I could make and supplements for my immune system and Minoxidil lotion for my scalp. I continued to visit the trichology centre, a 2 hour journey from Reading, every 3 weeks for the next year. My 30 minute appointment included a thorough examination, a treatment under a powerful sun lamp and electrotherapy. At the beginning of October, my hair gradually receded from my hairline at the front and back until I had more bald patches than I had hair. By the end of December I had lost all the hair on my head and body, I had even lost my eyebrows – I had to pencil them in each morning. This was the turning point as it couldn’t get any worse, I was utterly and completely bald from head to toe. 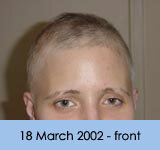 I had Alopecia Universalis. In early January I felt the first very fine new hair growth. This continued gradually and I looked forward to my appointments at the Centre for confirmation that it was growing well. 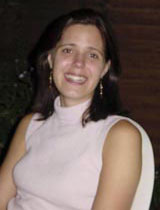 Sally was always very positive and encouraging but remained realistic and honest, she never gave me false hope. At the end of April I discovered I was pregnant, this meant I had to stop using the Minoxidil scalp lotion I had been using. Sally recommended a natural version made from plant extracts, which I switched to. From that first new hair growth in January I didn’t look back. Every month I’d notice a marked improvement until September, when I had my last appointment. A year after the first bald patch appeared, the hair had almost totally recovered. I had very nearly a full head of hair, it was grey so I had it cut and coloured and went out for the first time in 11 months without a wig. At last I was over my Alopecia. In my case I found the NHS system totally failed me. Sally was the first and only professional person to make me feel that hair loss was a condition worth taking the time to treat. Even better, she didn’t just try and treat the symptoms, she took time to understand and treat the cause of the hair loss. When I had my first appointment in September, I had pretty much hit rock bottom but even though my hair continued to fall out until December, Sally saw me through the worst of it. It’s a shame there aren’t more centres like the one in Evesham, I still haven’t come across any closer to my home. I’ll never know exactly why I lost my hair and maybe it would have returned on its own but I believe that the treatment I had at the trichology centre helped significantly to speed up the process. I wouldn’t hesitate to recommend the Trichology Centre to anyone with hair or scalp problems.